Soon to be a major motion picture starring Matthew McConaughey and Idris Elba The fourth volume in the brilliant Dark Tower Series is splendidly tense rip-roaring (""Publishers Weekly"") a #1 national bestseller about an epic quest to save the universe. 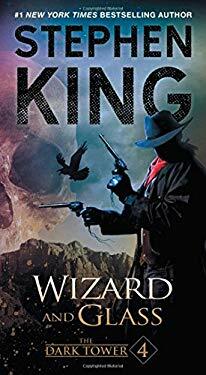 In ""Wizard and Glass,"" Stephen King is at his most ebullient sweeping readers up in swells of passion (""Publishers Weekly"") as Roland the Gunslinger, Eddie, Susannah, and Jake survive Blaine the Mono s final crash, only to find themselves stranded in an alternate version of Topeka, Kansas, that has been ravaged by the superflu virus. While following the deserted I-70 toward a distant glass palace, Roland recounts his tragic story about a seaside town called Hambry, where he fell in love with a girl named Susan Delgado, and where he and his old ""tet""-mates Alain and Cuthbert battled the forces of John Farson, the harrier who with a little help from a seeing sphere called Maerlyn s Grapefruit ignited Mid-World s final war. Filled with blazing action (""Booklist""), the fourth installment in the Dark Tower Series whets the appetite for more (""Bangor Daily News""). ""Wizard and Glass"" is a thrilling read from the reigning King of American popular literature (""Los Angeles Daily News""). New (1 available) 1501161830 New book. WELLER BOOK WORKS, A.B.A.A.